The acid test of any emerging communications rate is a live field trial. The whole ecosystem must come together—from chips to systems, from lasers to complete optical links—before a single bit of large traffic can be sent. It’s where the rubber meets the road. Dr. Paul Brooks explains, “Viavi’s ONT-600 400G was at the core of this successful trial between New York and Washington, DC. Before the trial was set in motion, Viavi’s ONT 400G was used by the system and module vendors to develop and validate each component. Then at system integration time the ONT characterized the traffic’s baseline performance. Finally, during the trial, the ONT acted as a load traffic generator and analyzer, ensuring each of the packets transmitted over the live network was corrected and accurately sent and decoded. Also at OFC, Viavi participated in a separate, live demonstration of an interoperating 400G network on the show floor with the Ethernet Alliance and Finisar. 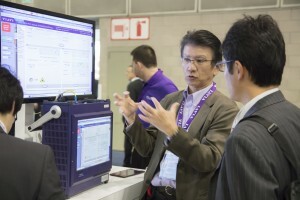 Here’s a video featuring John D’Ambrosia from the Ethernet Alliance describing the demo. Learn more about Viavi’s leading-edge ONT-600 400G, the 400G Ecosystem, or contact your Viavi rep for a demo.